There a quite a few things you are going to have to take into account if you have a damaged roof and are in two minds, wether to replace it or simply fix it. I’ve put together a list of useful questions you can answer to help you make the right decision. How old is your roof, and how long is it realistically expected to last? If you have a 19 year old roof and it is only expected to realistcally last for 20 years it makes sense to replace it, if your finances allow it. 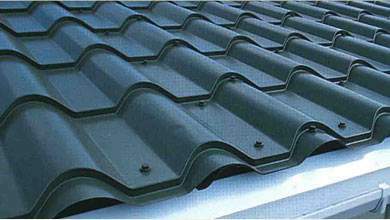 I’ve listed below the most common roofing materials and given some approximate lifespan ideas. Cement Tiles: This is probably the most common roofing material that is used residentially and it’s usually expected to last around 40 years in the UK. 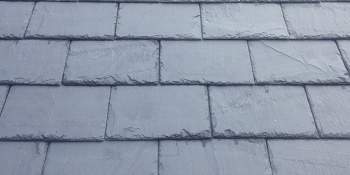 Natural Slate: This is generally found used on older listed buildings. Natural slate can last well into 100 years. 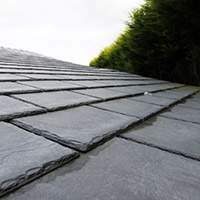 Synthetic Slate: Designed to look like natural slate, synthetic slate is made up of a mixture of plastic and rubber with a lifespam of between 40-50 years. (Most new synthetic slate comes with a guarantee of around 40 years). 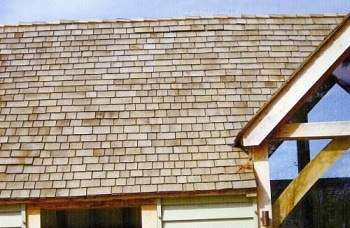 Cedar Shingles: Cedar Shingles are used for domestic and commercial roofing, they are generally produced from material remaining after logs have been processed by commercial mills and although quite expensive they look superb. I would expect these to last around 25 years but this could be increased to around 40 years if treated with with Tanalith ‘E’ preservative. Metal: Metal roofing is gaining in popularity here in the UK. The lifespan is good to at around 50 years. Depending on how old your roof is compared to how long its lifespam is, here are a few suggestions on when you are best off repairing apposed to replacing your roof. If you want to increase the desirability and value of your home. Replacing or fixing your roof is just the start. You will now need to decide if you think it is a job you are capable of carrying out yourself or if you are going to employ a professional to do the work for you. If you are having issues with your roof and want some advice, please feel free to contact our office on 01733 306022 or visit our roofing information page and request a quote for any work you might require. 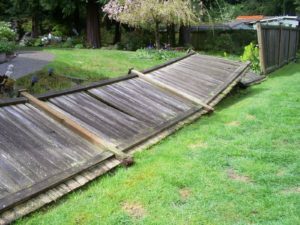 In this post we are going to give you some helpful advice if you have been unfortunate to have your fence blown down due to high winds. What options do you have with a blown down fence? Nobody can prevent bad weather and if you've been unfortunate enough to have your fence blown down because of a storm, you really have two options -repair the fence or replace it. The choice is going to be down to the severity of the damage and wether the fence posts or panels are beyond repair. In most cases its probably going to be more economical and sensible to simply replace your fence with a new one. We always recommend installing a high quality fence that will withstand strong winds and suffer minimal damage even under the strongest of conditions. A well installed closeboard fence with concrete posts from Peterborough Improvements should last 10 - 15 years. What makes a fence weak to the weather? 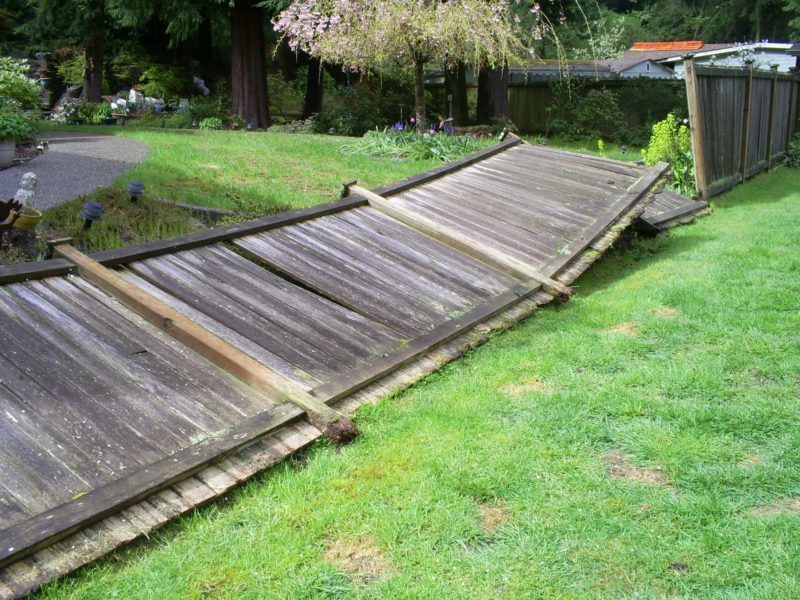 The main reason for a weak fence is usually down to wear and tear. If the fence is more than 10 years old it likely that the posts (if wooden) will have become weakened at the base due to moisture in the soil soaking through into the wood. If the fence has been poorly installed this is obviously going to affect its ability to stand up to adverse weather. It may be that the posts have not been set deep enough into the ground, or not concreted in. Who's responsible for a fence? Is it you or your neighbour ? Dispite what many people might tell you, there is in fact no general rule about you owning the fence on the left or the fence on the right as you look out onto your garden. The truth is that the property developer who built your house originally would have devided the land into plots and each plot would have had its own boundarys assigned. This is something you should be able to find on your conveyance deed or "transfer deed" under "the boundaries for which the buyer is reponsible." If you are living in an area that is prone to high winds you might want to consider a fence that allows the wind to pass through it. Installing garden railings or a picket fence will allow the wind to pass through whilst still giving an amount of privacy and security. Make sure that your posts are set at least 2 foot into the ground and secure with concrete to increase the stability. Treating your fence with a fence treatment product will increase its resistance to moisture and prevent it from rotting away over time. In most cases if more than half of the fence is damaged it is economically best to replace a damaged fence with a new one. If your fence does need replacing we will happily give you a free quotation and advise on the best fence to install. All our fences are professionally installed to the highest standard and are built to last. You can find more information about our fencing installations here. Would you like a free quotation to fit a new fence or for some repair work?